Folders allow you to organize Loom videos that live in your My Videos library. You can move, star, and rename your folders but please keep in mind that your videos will populate in chronological order within their respected folder. To create a new folder, you can use the New Folder button located on the top right corner of your My Videos library. You can then move more videos into that folder by using the Move feature (available when a video is selected) or by dragging and dropping videos into the folder. You can also create as many sub-folders as you'd like. 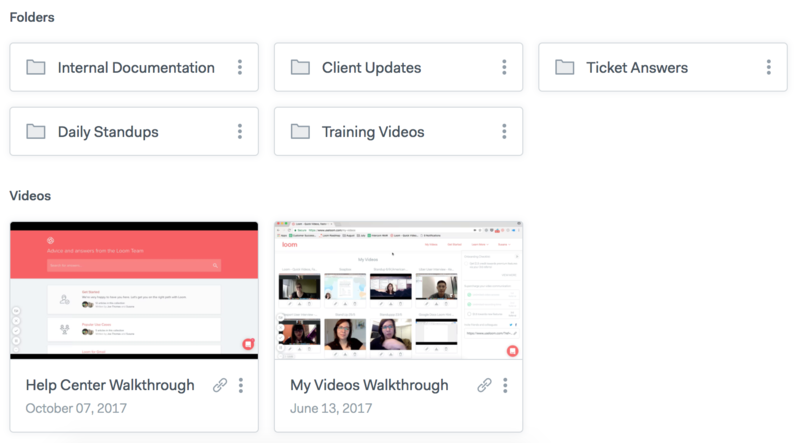 You can select one or multiple videos or folders to easily manage your My Videos library. When videos and/or folders are selected, options to Rename, Move and Archive will become available. Rename is only available when selecting a single video or folder. The folder will appear in the Starred section on the left side menu. Simply click on the golden star to remove the folder from your Starred section. It is not possible to share an entire folder with another person or team at the moment. You will still need to share each Loom video individually via one of the four sharing options available. To delete a folder, you'll first need to select Archive from the folder options and then go into your Archived folder to delete it permanently. Your Archived folder is in the bottom left of your my video page. We've added this extra step just in case you'd like to recover any videos at a later date. Find out how to share a link to a public folder. This can be particularly useful if you're sharing information with your entire team or customers.